A few times in life someone will say something that is so right, so true and at exactly the right time, that it changes your life forever. I’m not sure if I’ve mentioned it or not, but, as of this month, I have completed the instructional portion of yoga teacher training. Now all that is left is studying for a written exam and practicing for the teaching evaluation, both of which will be completed at a yoga retreat in July. No problem right. All good stuff. Right. Not so much at the moment. I have put myself in a situation that is challenging the confidence that I have worked hard to build and hold on to. Then, when I gave it a little more thought, I realized who I was subbing for (she is an amazing teacher), the typical size of weekend classes, and the expectation of a strong flow that seems to come with it being a hot vinyasa class. Did I mention is 75 minutes long? The absolute longest I’ve ever taught is 60 minutes. Again, thoughts of what was I thinking enter my head. That confidence that so quickly said yes is now teetering on a fence between I can do this and what the heck was I thinking. In my relentless reading and search for words that would ring true [and helpful], I remembered I have a collection of quotes that after hearing them one time, I never forgot. 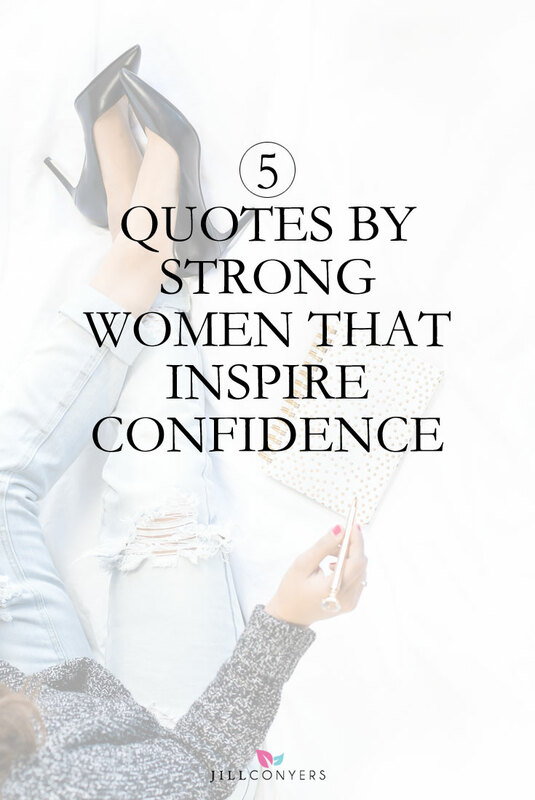 In the words by these amazing women lies the secret to authentic success, the inspiration to embrace your own uniqueness and to live the life that is undeniably your own. Maybe it’s a good thing I didn’t give my answer too much thought. There’s a chance I would have talked myself out of it. That would mean a fear of failure or lack of confidence would have caused me to miss out on an amazing opportunity and not to mention the fact that this is what I’ve been training to do since January. Yes, it’s true. I have a thing for words. Check out the quotes page and quote images for more inspiration and motivation. There’s also 5 Quotes That Inspire a Belief In Yourself. And, 5 Quotes That Will Inspire You To Live Your Dreams. Have you ever found yourself in a situation that you answered without giving too much thought? How did it work out for you? Do you have a favorite quote that you would consider life changing? Do you think that is even possible? Has fear of failure ever stopped you from doing something? Have an awesome weekend everyone! And if you think about it, on Sunday morning send positives thoughts and vibes my way. Guess what, Jill? You won the linky party! You will be featured this Friday on my site! Yay! Congratulations! I just read a post that had quotes from the DNC. I love inspirational quotes and have blogged about them myself. I am planning to again. I love Brene Brown – she is such an inspiration for midlife women. The Oprah quote was great too. Authenticity and being our true “self” is what life is all about. I love all of these quotes!! But I especially love my girl Brene Brown. She is truly amazing and inspirational and so are you Jill! Thanks for sharing the positivity! I think it is pretty awesome that you are working on your Yoga teaching credential! I actually considered that many moons ago but I realized that I did not have the time to commit to it. But I will reconsider it in the future. 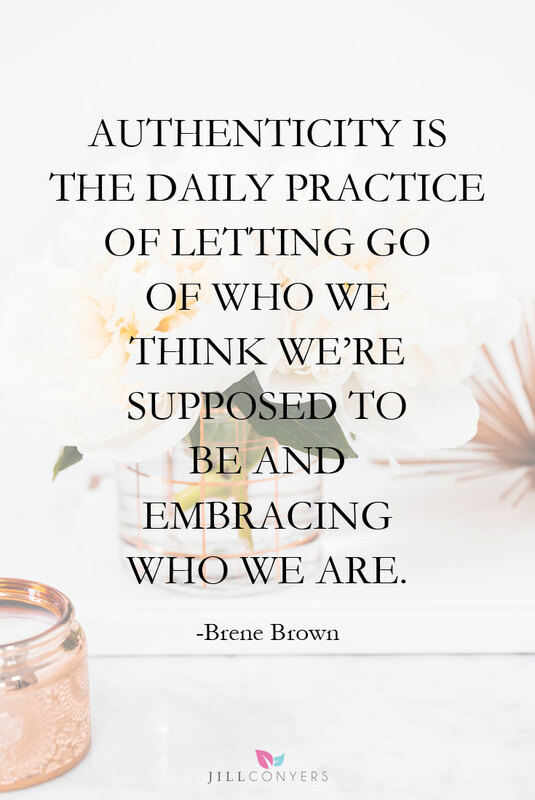 Thanks for sharing the inspirational quotes on ‘authenticity’. this is really motivating! i love inspiring quotes, gets me going. Lovely and empowering quotes. You are going to rock this class! You got this! All these quotes are great, but I especially love the first two. I do love a good quote. These are really inspiring for women. I think I may need to print a few out. I love the Oprah quote, these are all great but that one really stood out to me! Loved the quotes and I’m sure you will rock subbing that class! Can’t wait to read about your future in yoga training! These are great quotes to live by! It’s really difficult for many people to stay true to themselves without regard for how they’re perceived by others — especially when you throw social media into the mix. These quotes are very inspirational. I love seeing women inspiring other women to be confident in themselves. I feel that often times in this day and age, women are pushed down and not motivated enough by those around them. It’s nice to be there for each other. As someone who constantly struggles with confidence, thank you! These are all so great and such fantastic reminders. I love them all…really couldn’t pick a favorite. It’s hard to pick my favorite of the quotes! 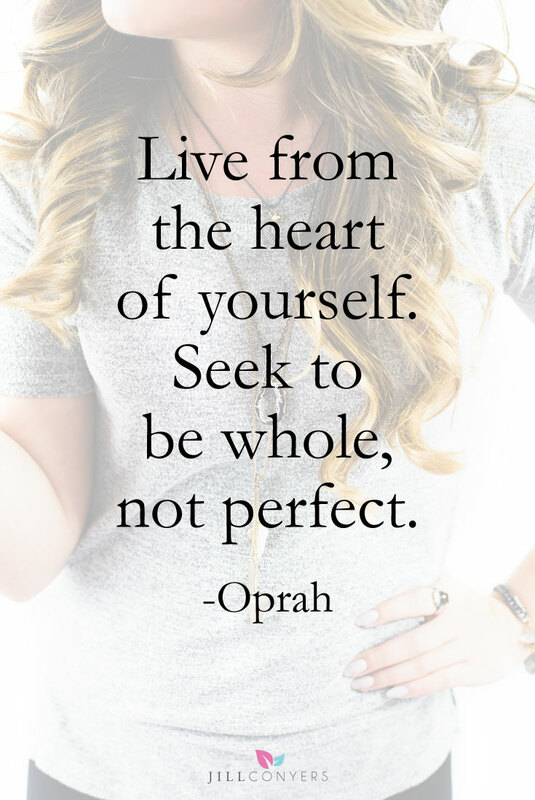 But I do love the second half of Oprah’s “Seek to be whole, not perfect.” That’s something I need to remember when life isn’t fitting into my idea of perfection! Thanks for the inspiration! 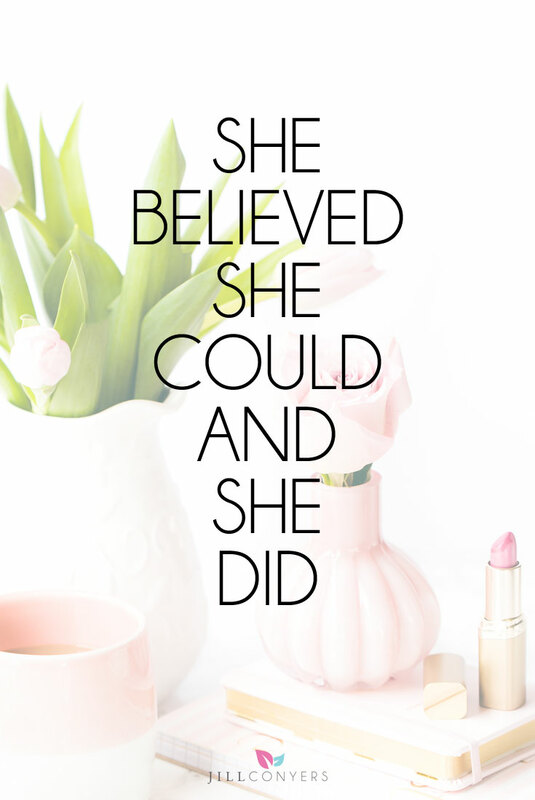 I love all of these but my favorite has always been, “She believed she could, so she did.” So simple but so powerful. It’s one of my mantras. Awesome quotes. Good luck teaching your class! Youre going to do great! She believe she could so she did is my mantra for life. You have to start in your mind, really believe you can do it and anything is possible. Self-doubt will be the killer of your desires. Perfection is a myth of human imagination. Love this post! The world needs more positive messages like these in hard times. For women and humanity. Great job! These are fantastic inspiration! It can take a lot of work to be yourself, especially as a woman in our society. But achieving that is incredible. These are all great quotes. I know exactly what you mean about words that change your life forever. Thank you for this Jill. Love these! I’m a real ‘words’ person so I love quotes so much. Especially love the Sophie Loren and Ophrah one. Thanks for collating them in one post! Great motivational quotes. Living an authentic life is so important for your overall health and wellness. You know you’re living authentically when your happy from your soul outward! I can always use some positive lady vibes, especially from such influential women! Love them all, however the second one if most important. It’s not only are food but are thoughts and believes that make us the person we are. My confidence must be fragile because it doesn’t take much for me to feel like you do about subbing for that class. Mostly it happens to me at work. I have a pretty thin skin. I wonder if that ever changes! I do rely on quotes to get me through tough times. So many good quotes, Jill!! Pinning for later when I need some motivation! I love all of these quotes. Great picks. I have a lot of quotes that are meaningful to me…from silly songs to profound verses of poetry and prose. I’m a three-time cancer survivor who’s seen my fair share of adversity and triumph, so there are definitely times when a quote is the right choice of words to remind me of where I need to be (mentally) during that time. By the way, congratulations on your yoga instruction completion – good luck studying for the exam! I have an impulsive quality about myself that I do not necessarily love. It gets me into trouble and situations that I sometimes regret. I have been working on it and taking a little time to think things over, but it is hard. the authenticity quote is my favorite. and always needed. <3 you so friend! I love these quotes! I am reading the Gifts of Imperfection by Brene Brown right now, so very timely. And congratulations on finishing the yoga instructional! For years I said “Yes” to anything and everything and then found myself worn out and depleted. This year I have changed my yes to no… and it has made the world of difference. I think a part of being confident is being able to say yes to yourself and no to everyone else and loving yourself along the way. These should be printed and hung everywhere so I can see them everyday. These are great and perfect timing as these were perfect reminders I needed today! LOVE these. All of the good vibes right back at ya! I appreciate strong women and especially talking about the tough topics of loving yourself and being authentic. These are great and so inspiring! I’ve never heard the first one but I really like it. I often struggle with trying to meet expectations that I think people have for me. Instead I should just be my best self regardless of what people think! 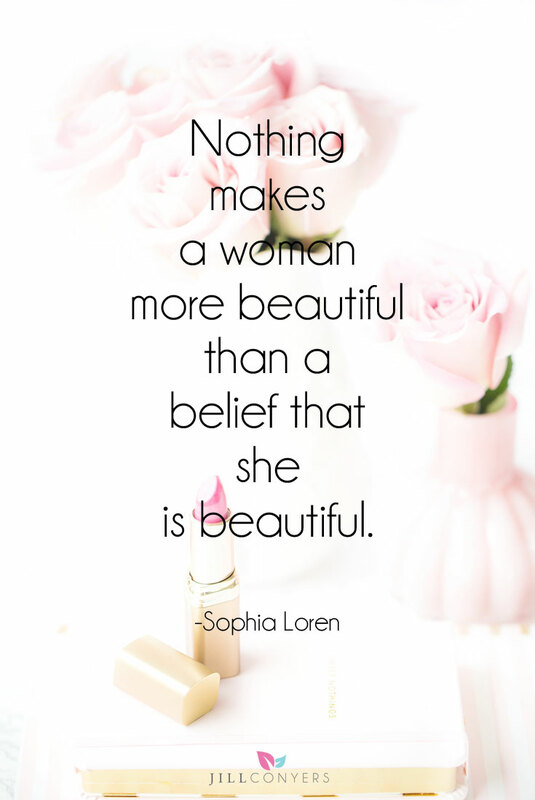 Love thei Sophie Loren quote. Another one of my faves is “everything u see I owe to spaghetti”. I love all of these quotes and are pinning some for later! It is easy to get inside our heads and use negative talk, we just have to recognize it and over power it with positivity. Congrats on being so close to getting your yoga certification! Tons of positive vibes your way! Exciting stuff! I love all the quotes! It is funny that you can come across someone that says the right thing at the right time and they did not know it! Great post today- I am smiling now!